Water conservation messaging based on seasonal and normative residential water consumption data. Photo courtesy of WaterSmart Software, Inc. Residential water usage is the largest consumer of energy in the state. One largely unexplored channel by which to reduce energy usage is through water conservation. Through research and pilot projects, CWEE is assessing the potential of behavior-based water interventions to reduce water usage, energy usage, and increase investment in energy and water efficient technologies. This approach leverages behavior-based water conservation as a tool to achieve water and energy savings and encourage water and energy utility partnerships. CWEEs work in this area provides an important contribution to the California Public Utility Commission’s efforts to encourage water and energy utility partnerships to pursue joint water and energy resource savings. Hot-water energy efficiency programs have historically focused on reducing energy consumption through rebates and direct installation of efficient water heaters and consumer devices. However, there is little causal evidence on the energy implications of water conservation programs, both in terms of energy usage and investment in energy efficient technologies. For example, to what extent will a behavior based water conservation program reduce electricity usage or entice households to purchase an energy efficient clothes washer? New opportunities are emerging to advance behavior-based water conservation through improved information sharing and consumer communication. CWEE’s current pilot studies involve assessing behavior-based water conservation through technology deployment and data analysis. There are a number of software conservation tools on the market that aim to drive behavioral change by communicating customer water consumption and comparing that with water use of their neighbors. Customized water reduction strategies are shared and the customer can track their water savings. This new tool is proving successful in achieving water reductions based on behavioral modifications of the consumer. 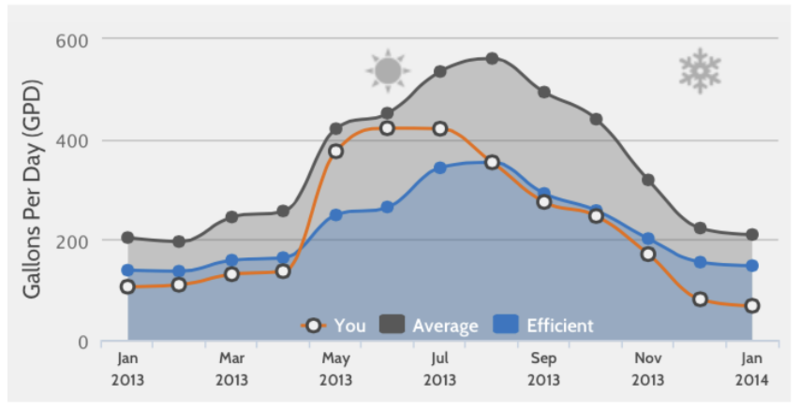 CWEE’s goals in these studies are to determine 1) how much of the total water use reduction observed from the technology deployment is attributable to behavior change; 2) the proportion of hot water savings relative to the total water use reduction; and 3) the energy and GHG savings associated with the hot water use reduction. Stay tuned for CWEE’s results on behavior-based water conservation.